Historical epic presents a dramatized account of the life and times of Alexander the Great. 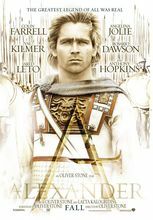 Part of a number of "swords-and-sandals" epics from acclaimed directors dotting the Hollywood landscape in the 2000s, Alexander presents viewers with a dramatized depiction of the life and storied career of Macedonian monarch and conqueror Alexander the Great. Nary a stone is left unturned in this glitzy, battle-heavy biopic, following the famed territorial expansionist from his earliest days as an embattled Macedonian royal through to his invasion of the Persian Empire and ultimate downfall.